Summary: We report a case of synchronous bilateral pituitary adenomas in a patient with multiple endocrine neoplasia type one (MEN1). The patient was previously known to have a pancreatic gastrinoma and had first-degree relatives with MEN1. Both adenomas were concurrently revealed by high-resolution MR imaging of the pituitary gland as part of the investigation of the patient's severe, persistent headaches and elevated serum prolactin level. Multiple endocrine neoplasia type 1 (MEN1) syndrome is an autosomal dominant inherited tumor syndrome, phenotypically characterised by the development of multiple endocrine tumors or hypersecretory states of the parathyroid, anterior pituitary, or islet cells of the pancreas. Thymic, foregut, and bronchial carcinomas are also associated with MEN1 syndrome. Collagenomas and facial angiofibromas are newly recognised but common skin expressions. Many tumors associated with MEN1 syndrome are benign; however, many enteropancreatic neuroendocrine tumors and foregut carcinoid tumors are malignant. The syndrome has a prevalence of 0.02 to 0.2 per 1000. Typically, MEN1 syndrome tumors begin 2 decades earlier than sporadic tumors of the same endocrine cells, demonstrate multiplicity, and are frequently recurrent. Pituitary adenomas occur in 28% to 30% of patients with MEN1. Synchronous anterior pituitary adenomas are very rare and have not been previously reported in association with MEN1. To our knowledge, our patient is the first reported case of synchronous bilateral pituitary adenomas in MEN1. A 26-year-old woman presented to the outpatient clinic with a 2-month history of severe, recurring headaches. Her medical history included a surgically resected pancreatic gastrinoma. She was also the fourth member of her family who was affected by MEN1 (Fig 1). On examination, she had no focal neurologic signs, normal visual acuity, and no visual field defects. The full physical examination also revealed no other abnormalities. Her most recent serum prolactin was 49 μg/L (normal range 0–30), which had been slowly rising over a 2-year period. The intact parathyroid hormone level was 6.4 pmol/L (normal range 1.1–5.3), plasma cortisol was 324 nmol/L (normal range 140–690 nmol/L), and 24-hour urinary cortisol was 93 nmol/d (normal range 80–280). Thyroid function tests and routine biochemistry were normal except for minimally elevated total serum calcium of 2.72 mmol/L (normal range 2.5–2.55). The corrected calcium remained minimally elevated at 2.58 mmol/L. This elevated serum calcium had been stable over a 2-year period. Family tree demonstrating the members of the patient's family and the MEN1-related expressions. Previous imaging included sonography and scintigraphy of the neck, which showed no evidence of a parathyroid adenoma. In view of increasing serum prolactin levels and headaches, MR imaging of the pituitary gland was performed to exclude a prolactinoma. Axial T2-weighted images of the whole brain, high-resolution pre- and postcontrast coronal T1-weighted and sagittal postcontrast images of the pituitary gland were acquired. The unenhanced coronal pituitary images showed two separate and distinct areas of hypointense signal in each lobe (Fig 2A). After administration of 10 mL of IV gadolinium, two nonenhancing foci, separated by normally enhanced pituitary tissue, were revealed (Fig 2B–E). The appearance was consistent with two separate 4-mm pituitary adenomas. There was no involvement of the cavernous sinuses or compromise of the anterior optic pathways. The patient was placed on bromocriptine mesylate, to which she responded favorably, with the serum prolactin falling to 34μg/L. A, Coronal T1-weighted unenhanced MR image (450/14/2 [TR/TE/excitations]) shows two low-signal foci within the pituitary gland. B, Coronal T1-weighted (637/14/2), fat-saturated, contrast-enhanced MR scan shows two nonenhancing foci, separated by normally enhancing pituitary tissue. C–E, T1-weighted (637/14/2), fat-saturated, contrast-enhanced sagittal scans from right to left reveal two adenomas (C, E). Interposed between the two adenomas is normal pituitary tissue and the infundibulum (D). Pituitary adenomas may develop sporadically or as part of the MEN1 syndrome. The gene responsible for the MEN1 syndrome, labelled the MEN1 gene, has recently been mapped on chromosome 11q13 and cloned. Studies of the MEN1-syndrome–associated tumors have revealed deletion of the second, wild-type MEN1 allele (1). The MEN1 gene has a widely expressed mRNA that encodes a protein, menin, of 610 amino acids. Most of the germline and somatic MEN1 gene mutations are predictive of truncation of menin, a likely destructive change. Inactivating MEN1 gene mutations in germline and in sporadic neoplasms support prior predictions that MEN1 is a tumor-suppressor gene. Germline MEN1 gene mutation underlies all or most cases of MEN1 syndrome (2). Genetic analysis clearly identifies gene carriers, allowing reliable screening in affected families. Candidates for MEN1 gene mutation testing include patients with MEN1 syndrome, or its phenocopies, and first-degree relatives of persons with MEN1 syndrome. In these patients, screening of all endocrine organs at regular intervals is necessary because of the development of additional endocrine manifestations, including adrenal tumors, Zollinger–Ellison syndrome, and thymic and cutaneous carcinomas (3). Hyperparathyroidism occurs in 95% of MEN1 patients by the age of 30 years, whereas an adenoma is only detected in 86% (4). 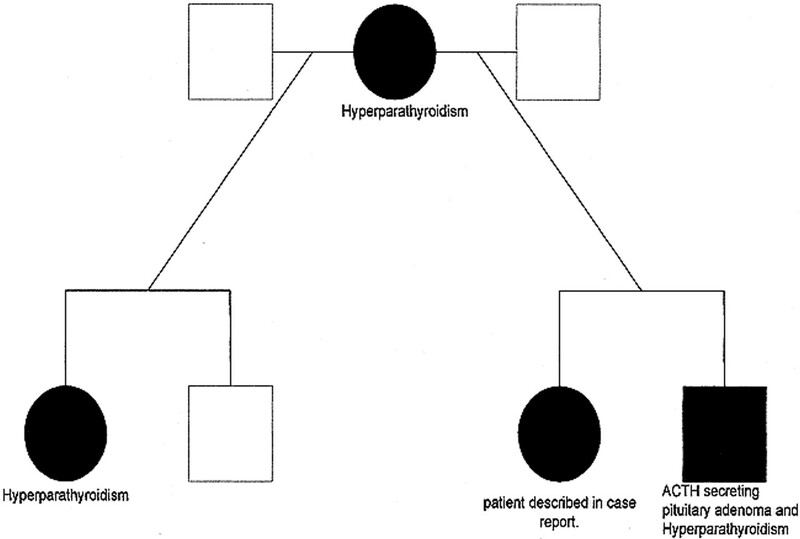 Hyperparathyroidism and hypercalcemia precede all other manifestations in the majority of cases. Pancreatic islet cell tumors occur in 40% to 50% of MEN1-affected individuals. Gastrinomas occur frequently among patients above the age of 40 years; however, insulinomas occur more commonly in individuals under the age of 40 years. All islet cell tumors produce polypeptides, but only those producing hormones are labelled as functioning tumors. Each tumor may produce many different hormones, but the overproduction of a single hormone is evident clinically (5). Forty percent of MEN1 patients have adrenocortical hyperplasia. Of these, 9% develop focal adrenal masses (adenomas or carcinomas). Several cases of adrenocortical carcinoma have been reported in association with hyperplasia and MEN1 syndrome. In all patients with adrenal involvement, pancreatic tumors are also present. This coexistence of adrenal and pancreatic tumors is not fully understood (6). Among patients with MEN1, the reported incidence of anterior pituitary adenomas ranges between 28% to 30% (7). Patients with MEN1 may develop prolactinomas, somatotrophinomas, and nonfunctioning adenomas. Seventy-six percent of these tumors are prolactinomas, and these behave more aggressively than sporadic prolactinomas. Forty-seven percent of prolactinomas grow disease despite medical treatment (8). Four cases of multiple, synchronous pituitary adenomas have been previously reported, none of which were associated with MEN1 or revealed by MR imaging. Tolis et al (9), in 1978, described a woman with two adenomas secreting prolactin and growth hormone (GH), respectively, which were resected separately by transsphenoidal surgery. After the first prolactinoma was resected, the patient's GH levels remained persistently elevated. The second transsphenoidal exploration revealed another adenoma. After resection, GH levels returned to normal. In 1981, Powers and Wilson (10) and Woosely (11) reported patients with double-prolactin–secreting pituitary adenomas. In 1992, Wynne et al (12) described a woman with Nelson's syndrome in whom there were two adenomas secreting prolactin and corticotropin, respectively. All previously reported cases of multiple synchronous tumors were identified by analysis of neurosurgical specimens without prior documentation by CT or MR imaging. Our patient responded well to medical treatment, and surgical intervention is not indicated at present. Histologic confirmation of the cell type was therefore not possible, but the gradual decrease in serum prolactin and the favorable response to treatment with bromocriptine mesylate, suggests that at least one of the adenomas is a prolactinoma. At present, our patient does not show any features of an aggressive MEN1 prolactinoma, because the serum prolactin level has decreased to 34μg/L. To our knowledge, this is the first reported case of MR-revealed, synchronous, bilateral adenomas detected in a patient with MEN1. ↵1 Address reprint requests to Dr. Anju Sahdev, Department of Imaging, Middlesex Hospital, Mortimer Street, London W1N 8NN U.K. Accepted after revision January 13, 2000.